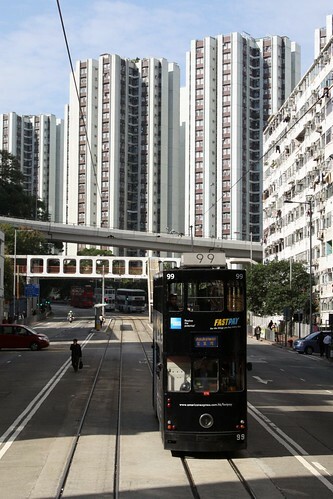 Welcome aboard everyone, it’s time to take a trip along Hong Kong Island by double deck tram. 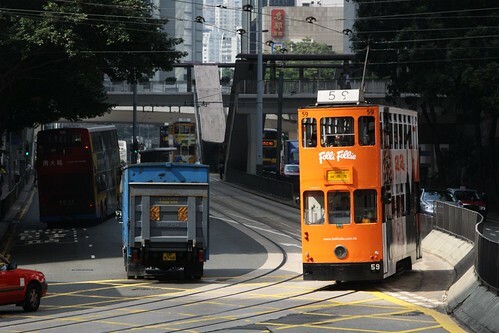 With a total system length of around 30 kilometres, the network runs along the northern shore of Hong Kong Island from Kennedy Town at the west end to Shau Kei Wan to the east, passing through the busiest parts of the city. When opened in 1904 the tracks ran along the island shoreline, but subsequent land reclamation has left the tram some distance inland. The majority of the system is double track, except for a single track loop around the racecourse at Happy Valley. While the trams themselves have controls at both ends, the system is a unidirectional one, so reversing loops and provided at the end of the line and at a number of intermediate termini along the system. This map gives you an idea of the distances involved. 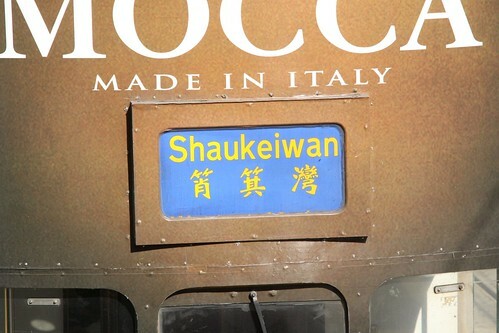 The destination of each tram is displayed on traditional canvas blinds at the front and rear of the tram, printed in both English and Chinese. Each destination also has a colour combination assigned to it, making it easier for passengers to pick out which tram they need. Here are the destinations that I found, ordered by distance along the network. There appears to be some logic to the colours assigned: each combination is only seen once on eastbound services and once on westbound services, with the exception of Happy Valley which sees trams from both directions. 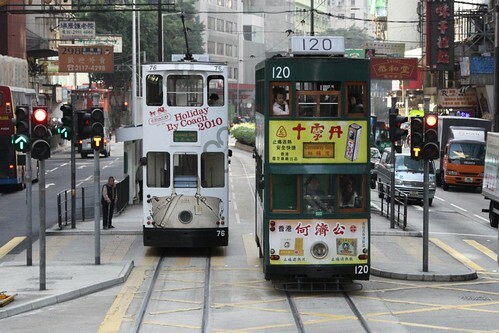 As for the tramcars themselves,the most numerous are the “Fourth Generation” cars which were modernised in the 1980s. Of this class, two cars (#70 and #120) were built in 1991 to the original 1950s design, the most obvious spotting feature being the timber window frames. 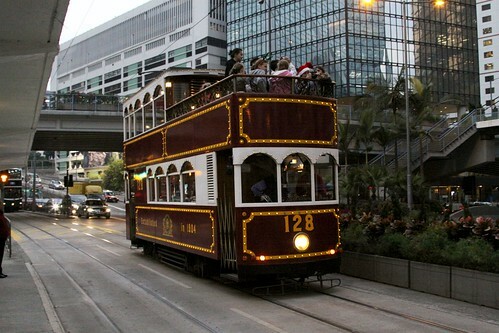 Another variant of tramcar are the open top vehicles used for charter services, numbered #28 and #128. The final type seen is service today are the “Millennium” or Fifth Generation cars. Numbered #168 to #171, these trams entered service in 2000 and were a radical change from the rest of the fleet, featuring streamlined bodies and a single piece windshield. 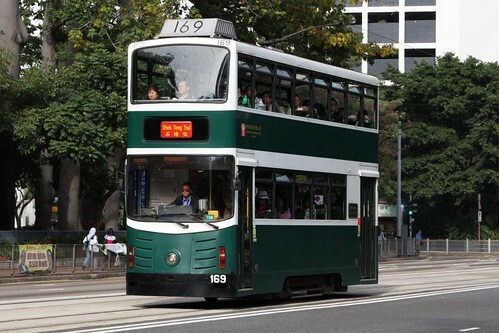 The new design was not considered a success, with tram #168 being rebuilt in 2010 to resemble the older fleet. From a photography perspective the scenery along the route varies: from old walk-up apartment blocks at Shau Kei Wa, cookie butter housing developments at Sai Wan Ho, shopping centres in Causeway Bay, and finally the glass and concrete of Admiralty, Central and Sheung Wan. By Kennedy Town the streets have turned back into walk-up apartment blocks, looking much the same as those you left behind at Shau Kei Wan an hour and a half before. 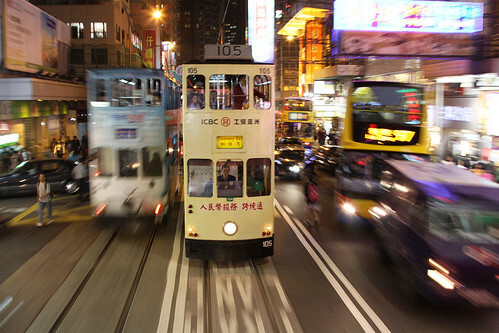 If you are planning your own tramway photography expedition, you will end up spending a lot of time fighting shadows. With the trams running down narrow streets surrounded by tall buildings, getting a nice sunny photo takes one part location scouting, and another part good timing. 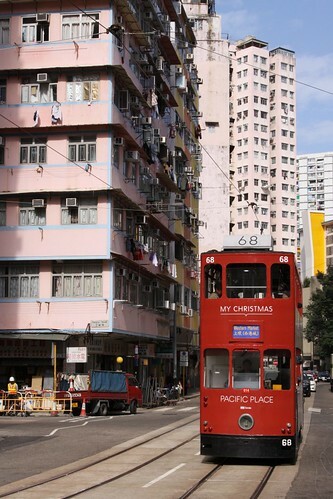 ‘Hong Kong Extras’ – a tourists guide to the tramway and places to see along the way. 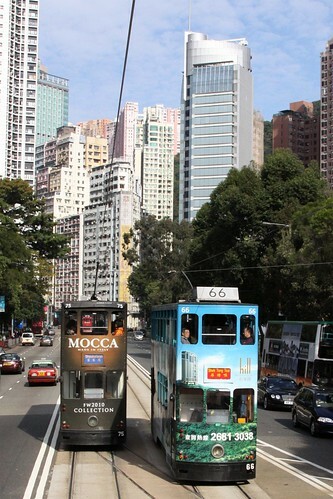 This entry was posted in Transport and tagged Hong Kong, Hong Kong Island, Hong Kong Tramways, light rail, trams. Bookmark the permalink. Yes, agree about the shadows. I managed to jag an acceptable photo or two during late arvo, while there was enough soft light around that still allowed a sharpish picture while the trams were still moving. Heading back to HK in November, so leeching stacks of info from this site. Keep it coming! If you’re headed over in November that’s the same time I visited, the shadows are already growing long at 3.30 in the afternoon. Glad to hear you find it useful, I’ve got a few more articles planned on railfan spots around Hong Kong, so I’d better get a move on!